CANFIT releases newest policy brief outlining strategies that six states are using to link local produce with after school and other out-of-school time programs. Now that after school programs across the country are implementing the federal after school meal program, the time has come to address issues of meal quality. One way to improve the overall nutritional quality of after school meals is to include more fresh, local produce. 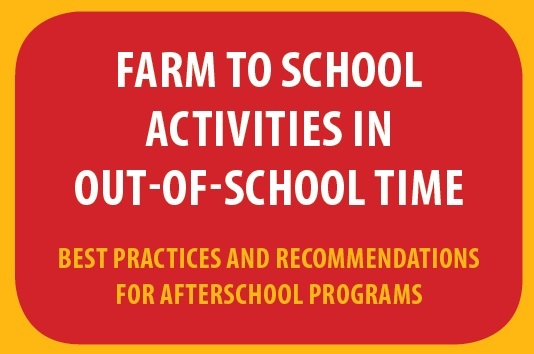 CANFIT’s newest policy brief, Farm to School Activities in Out-of-School Time: Best Practices and Recommendations for Afterschool Programs, outlines strategies that six states are using to link local produce with after school and other out-of-school time programs. Written in collaboration with the National Farm to School Network, the policy brief is meant to inform and guide future farm to school activities in OST. In addition to providing a snapshot of current activities, the report offers recommendations for expanding farm to school activities in OST so that we can build healthier food environments for children. You can access the full report at: http://www.canfit.org/downloads. #CANFIT20 celebrates CANFIT’s 20-year anniversary with a monthly blog on the 20th day of each month beginning in August 2013 and other blogs, tweets, and social media posts on history tid-bits on CANFIT’s journey to helping low-income communities strive for healthy eating and physical activity environments. Worked with CANFIT before? Share your stories and thoughts in our 20th Anniversary Assessment today and have your chance at a monthly drawing for a CANFIT gift box valued at $200! No comments yet on #CANFIT20: Farm to School in Out of School. Be the first to comment.